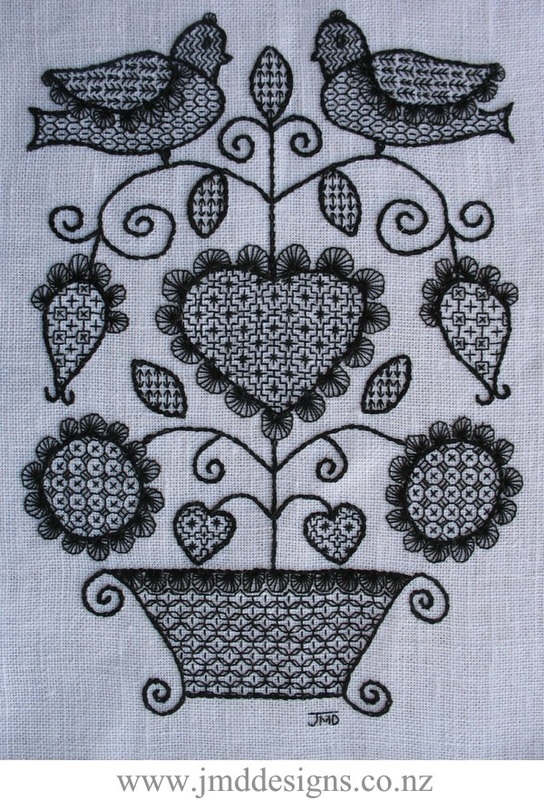 Blackwork embroidery was first thought to have come from Spain to England; where Catherine of Aragon, the wife of Henry the VIII made the embroidery style most popular for cuffs and collars etc during the Tudor period. This style of design was brought about as a cheaper version of lace around the period of 1509, as taxes on lace were high. 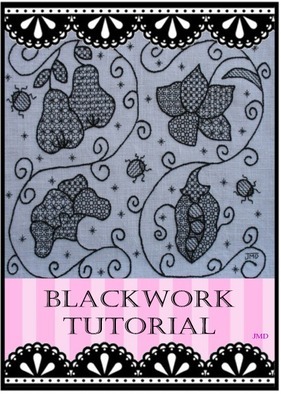 An even weave fabric (same amount of threads per weft and warp in a 1 inch measurement) is needed for Blackwork. Open or closed even weave fabric can be used. If stitching on a closed weave fabric, but wanting an open look to your stitch fillings, a stitch can be made over more fabric threads for each stitch made. Contemporary designs have been done on uneven weave fabric with a waste canvas being placed over the fabric first as a guide for the stitches. Then the canvas is removed when stitching is complete. 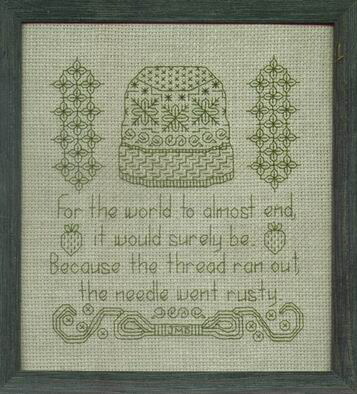 Thread thickness used depends on the final appearance of the design you require. A selection of thread thickness can be used in one design to produce perception of depth. Silks, Stranded Cottons, Cotton a Broder and metallic threads can be used. What is used depends on the look you want to produce for your design and the thread count of your fabric or stitch length used. Metallic threads are used to highlight a design. Also beads add to a design. 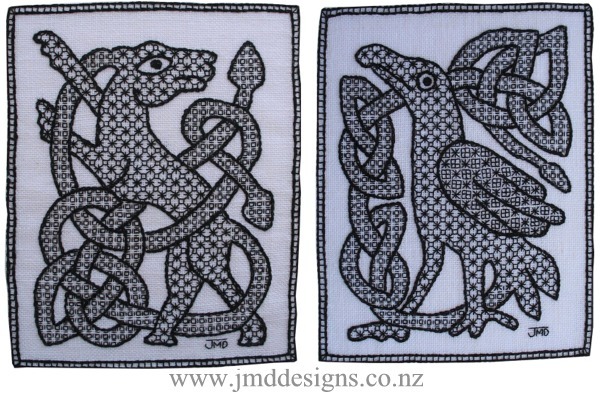 There are three main styles within the Blackwork category. 1. 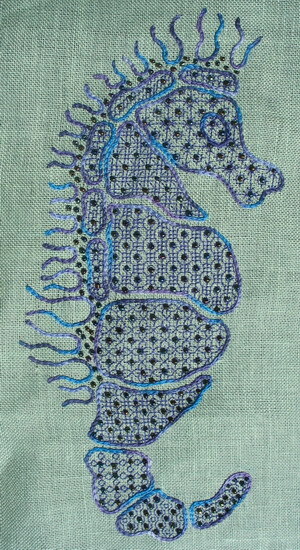 Motifs and Borders: Motifs are small designs on their own, not made of fillings stitches, but more of lines. Borders can be made with a length of design made of lines not fillings. 2. Design areas are outlined and then fillings are stitched inside the design areas: The design outline is stitched either without following the grain of the fabric or following it. 3. A variety of filling patterns are used to show design edges, using different density in the fillings chosen. 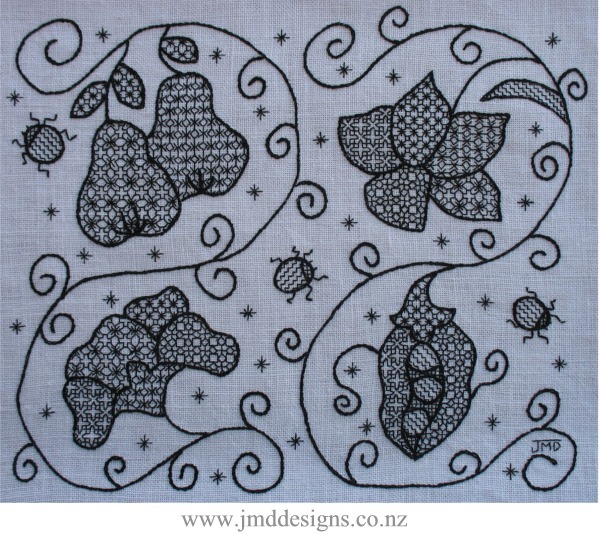 The outline of each element in a design is not stitched first, but the density of filling stitches in the overall design is different, to give depth to parts of the design and to show where design elements start or finish or merge into each other. Design Size (each): 13.5cm x 17.5cm ( 5 1/4 x 7”). Fabric: #28 even weave or 14# Aida. Design Size: 24cm x 16cm (9 1/2 x 6 1/2”). Fabric: #28 even weave or 14# Aida. This design is based on Schwalm designs that originated in Germany and are named after the river Schwalm and its surrounding area. 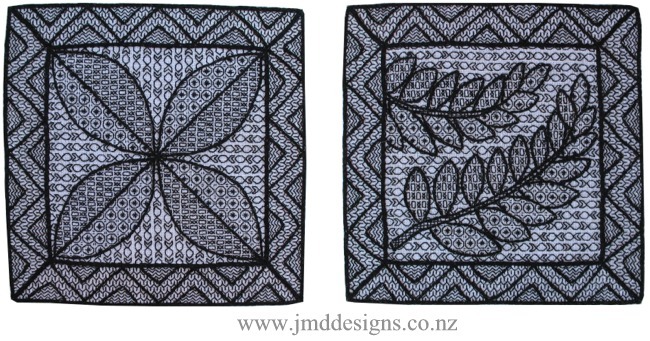 I have used the traditional Schwalm design symbols, but instead of filling the design areas with cut and pulled stitches I have used Blackwork Filling stitches. The Buttonhole Scallops stitched around some of the design symbols are a Schwalm aspect also. Originally Schwalm designs could be found as early as the 17th century.The design depicts the Schwalm 'Tree of Life', with life growing out of the mother earth. Love multiplying; the sun shining down on you; the flowers of nature and the dove of peace. Originally the dove was a crow, but over the centuries this has been modeled into a dove. Design Size (each): 16cm square (6 1/4 inches) Fabric: #28 even weave or 14# Aida. This page is not to be copied or cut and pasted into other websites.